Volunteers for Israel, a 36-year-old nonprofit, is excited to announce a new program – VFI PLUS ARCHAEOLOGY. This 14-day all-inclusive program melds one week of volunteering on an Israeli IDF Army base with the following week volunteering on an active dig supervised by the Israel Antiquities Authority (IAA), and focusing on relics from 3,500 BCE. The program is offered Nov. 18 to Dec. 1, 2018. The 14-day program starts with 4.5 days volunteering on an Israel Defense Forces base; followed by 2.5 days private, small group guided touring; followed by 5 days volunteering at the Tel Assar archaeological site in the Haifa District; followed by 2 more days private guided touring; and ending with a transfer to Ben Gurion Airport. VFI/Sar-El volunteers will spend five days excavating alongside a large team of IAA archaeologists. The VFI dedicated guide will discuss the history of the site and the area, and provide personalized attention to the group’s work. This program is a collaboration between VFI, Sar-El (www.sar-el.org/), IAA (http://www.antiquities.org.il/default_en.aspx) and GIL Travel (www.giltravel.com), and is focused on raising awareness of Israel’s archaeological treasures, in addition to immersion in Israel’s culture. For the past 36 years, VFI has partnered with the Israeli organization Sar-El to process and prepare Americans to volunteer on IDF supply/logistics bases. Sar-El is an acronym for the Hebrew words Sherut L’Yisrael (Service to Israel). 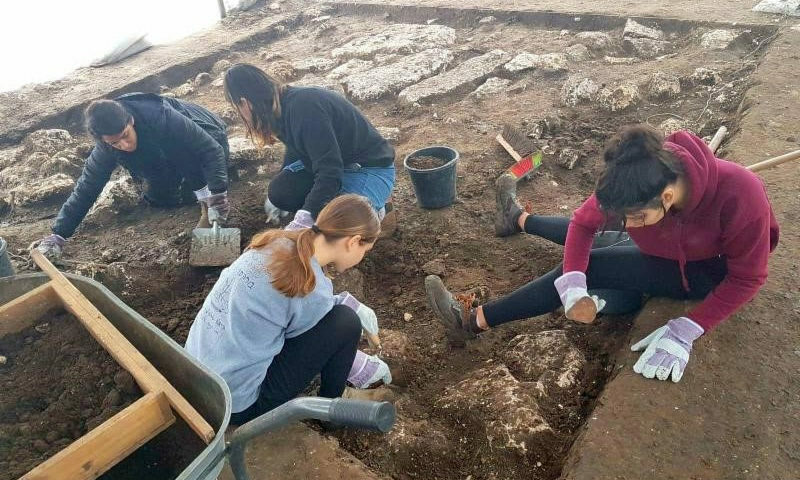 The Israel Antiquities Authority (IAA) has opened a new and exciting flagship excavation located at the foot of Tel Assar, not far from the town of Pardes Hanna-Karkur, in the Haifa District. The site covers the Chalcolithic period, right up to the Early Bronze Age. The Chalcolithic period, or Copper Age, was an era of transition between the stone tool-using farmers of the Neolithic and the metal-obsessed civilizations of the Bronze Age. It began in the late 5th millennium BCE and lasted for 1,000 years before it gave rise to the Early Bronze Age (approximately 4300-3300 BCE). The Tel Assar excavation began in May 2018 and is a huge undertaking, with about 300 archaeologists and workers devoted to this project. This is a well-established archaeological site. Work at the site is physical. Participants will have to be physically fit and have stamina to enjoy this experience. Traditional digging and excavation tools such as picks, shovels, hand trowels, etc., will be provided. The work hours are 6:30 am to 2:30 pm, Sunday to Thursday, and includes two breaks over the course of the day. Volunteers must bring their lunch and water every day. The cost, not including airfare to Tel Aviv, is $2,499 for dual occupancy. Applications are accepted through Sept. 30, 2018. To begin the application process, go to www.giltravel.com/tour/vfi-plus-advanced- or www.vfi-usa.org.